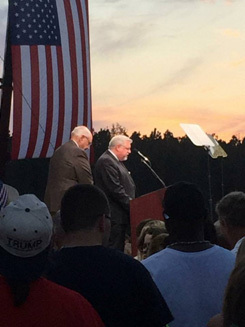 This week, the Trump Campaign invited me to give the Invocation at the Trump Rally in Selma, North Carolina. The Johnston County Sheriff's Department estimated the crowd at 17,500. Our gracious God, just as our state's Constitution says in its preamble, we are grateful to you, the Sovereign Ruler of Nations, for the preservation of the American Union and the existence of our civil, political and religious liberties. We acknowledge our dependence upon you for the continuance of these blessings to us and our posterity. At this juncture, during this election cycle, we are at a great tipping point. The differences between the candidates from the top of the ballot and all the way down the ballot; couldn't be more striking. We will choose between those who represent different answers to questions of fundamental moral and political import. We will become a nation that moves closer to recognizing and enforcing respect for the sanctity of human life at every stage, or we will move further away from it. We will protect and preserve the First and Second Amendments or we will possibly render them null and void by the misguided notions of political correctness. We will be a nation of borders or we will undermine our own sovereignty by failing to deal effectively with the issue of illegal immigration. Justices will be appointed to our courts that interpret our Constitution according to the fixed meaning given to it by our Founders, or we will have justices that impose whatever the legal profession deems or cultural elites' decree for us? We will uphold the eternal verity that the rights of the individual are unalienable – meaning given to us by you, O God, which no government has the right to infringe upon, or the erroneous view that the state gives us our rights will become more and more pervasive? We will remain a people of common sense or we will support policies like men in women's restrooms, locker rooms and showers? Lord, may we not fail to recognize the urgency of our choices at this moment in history. What will be decided on November 8th could not only set the course for the rest of our lives, but also that of our children and grandchildren for many years to come. It may even decide whether we can keep the Republic handed down to us by our forefathers and defended in blood. Here in this place today, we rally in support of those who are not without their flaws, but we trust are patriots. We pray that they will be candidates who are just as concerned with finding favor with you as they are about finding favor with the electorate. We pray that they would walk in truth that your power might rest upon them. And if they indeed do walk upright before you, we ask that your providence would exalt them to positions whereby your blessings may flow through them to our land. Grant us your presence now. Bless these proceedings, if you would be so gracious. 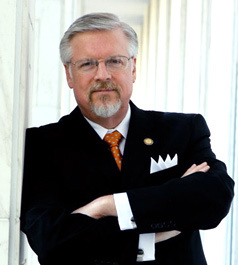 And use them to preserve our Union – to strengthen and save our great state and country – use them that we might truly be "one nation, under God, indivisible, with liberty and justice for all."